UK Postcode Boundaries in KML format; this is a geographic polygon file showing the areas for Postcode, Postcode Sectors, Districts and Areas in the UK. This file requires the use of a Geographic Information System (GIS) such as MapInfo, Arc Info or Google Maps to view the boundaries. File formats available include: DXF, KML, MIF/ MID, SHApe, ESRI and KMZ. 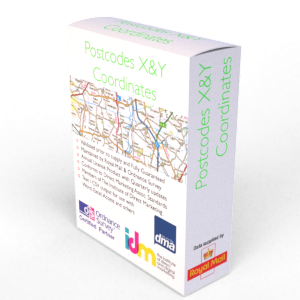 This boundaries file is created from official Ordnance Survey and Royal Mail data sources and is updated every three months to provide the most up to date and cost-effective postcode boundary file currently available. Increase revenues though more efficient time management and reduce operational overheads to increase profits. Increase sales conversions and profits through improved targeting. Identifying hidden opportunities by comparing retail networks or sales areas to target market concentrations. Reducing financial exposure through improved risk assessment. Optimise franchise and dealer networks to better serve your target audience. Minimise delivery costs to customers through efficient scheduling and routing. The boundaries have been created from Ordnance Survey location data which have a Positional Quality Indicator (PQI) indicating that the contributing grid references are “Within the building of the matched address closest to the postcode mean determined automatically by Ordnance Survey." The result is a set of boundaries that will fall correctly between the contributing Postcode locations. It should be noted that as these boundaries are created programmatically they will not accurately follow natural or man-made bounding features such as rivers, canals or road networks. An example of the accuracy of the data is shown in the images on the postcode boundaries product specification document. British National Grid (OSGB). Latitude/ Longitude (WGS84) projection is available upon request. KML format is supplied within a Zip compressed file. For use in all GIS or mapping systems which accept the KML format. Please see the product specification document. A download link is sent automatically once your order is completed. Annual licence includes all updates throughout the year. At the end of the year re-purchase or deletion is required. The Postcode boundary file is licensed annually for each user that has access to it.